My simple mitt pattern is as simple as can be, but I really don't like sewing up, so I have rewritten the pattern for knitting in the round. put 2 stitches (first and last of round) on another needle, or identify these 2 stitches with markers. This is the start of the thumb. k2tog, k to 2 before thumb, k2tog, increase thumb as before. continue increasing thumb until 15 stitches. 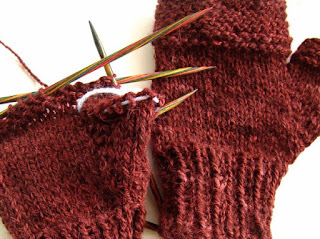 knit two rounds of main 30 stitches, joining when you get to the thumb. 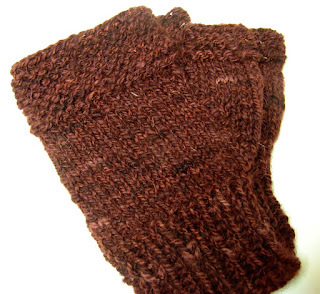 Mmm they look like good rugged warm mittens.